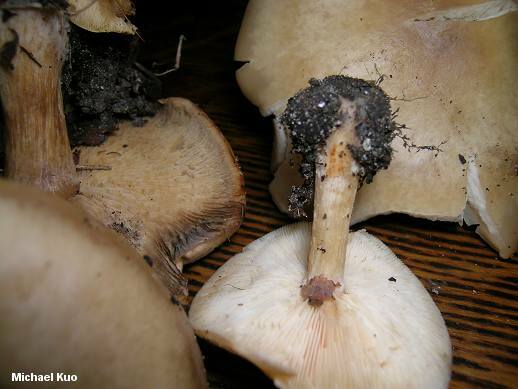 The size alone will distinguish Melanoleuca cognata from most species in the genus, which is a "plus" when it comes to identification efforts--but the accompanying "minus" is that the large size of this mushroom makes it easily confused with species of Tricholoma (stem usually more stout; spores inamyloid) or Leucopaxillus (gills often separable as a layer; copious mycelium attached to stem). Aside from the large size, distinguishing features for Melanoleuca cognata include its gills, which are initially white but soon turn yellowish-pinkish to pale tan--and its peculiar odor, somewhere between "sweet" and "mealy." Ecology: Probably saprobic; found in woods (often under conifers) or in grassy waste areas; spring, summer, and fall; widely distributed in North America. Cap: 5-13 cm across; broadly convex or flat, often with a very shallow central bump; smooth; greasy when fresh; brown when fresh, fading to tan; often with a slightly darker center. 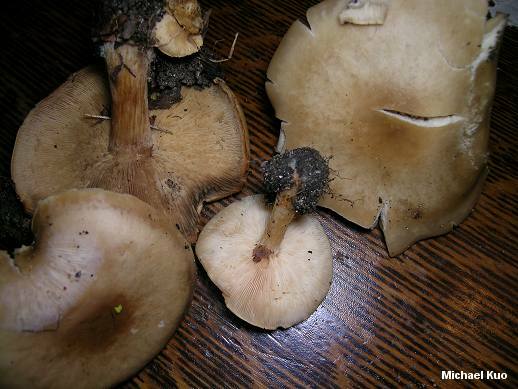 Gills: Attached to the stem, usually with a "notch"; close or crowded; white at first, soon yellowish-pinkish to tan or pale brown. Stem: 6-12 cm long; up to 2 cm thick; equal; often somewhat twisted; dry; brownish or whitish; usually with tiny brown fibrils; basal mycelium white. Odor and Taste: Odor sweetly fragrant to mealy (often somewhere in between); odor of dried specimens pungent, like the odor of many mealy mushrooms when dried; taste not distinctive or sweetish-mealy. Microscopic Features: Spores 7-10 x 4.5-6.5 µ; more or less elliptical; ornamented with amyloid warts; apiculus inamyloid. Pleurocystidia and cheilocystidia abundant; variously shaped but often fusoid-ventricose; often capped with apical incrustations; occasionally septate; up to 70 x 20 µ.
REFERENCES: (Fries, 1874) Konrad & Maublanc, 1927. (Saccardo, 1887; Smith, Smith & Weber, 1979; Moser, 1983; Arora, 1986; Breitenbach & Kränzlin, 1991; Phillips, 1991/2005; Hansen & Knudsen, 1992; Evenson, 1997; McNeil, 2006.) Herb. Kuo 05230505.